Crafting Process : Paper Pulp Moulding & Hand Painted. In this trinket can keep ornaments, gifts, make up items, coins, antiques etc. 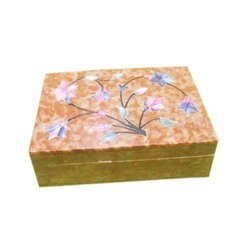 Use this storage box as a trinket box, jewelry box or as general storage for dining essentials. With multiple usage, this box is handcrafted with intricate geometric details of brass inlay. The technique is peculiar to the northern region of India and requires fine precision. Intricately detailed hand carved ornament. The box measures 5 3/5 inches x 3 1/2 inches x 1 3/5 inch / 14 cm x 8.8 cm x 4 cm (L x W x H). Trinket boxes to keep order on the dressing table and jewellery boxes/rolls are made in different designs, sizes and colours. Coordinated with these bags make for a well considered look.